While good things are happening under the surface for Gold, its lack of a strong rebound in recent months argues that such a rebound is in the future but not imminent. Gold’s steady downtrend could resume in the next week or two. As we know, the precious metals complex enjoyed another very strong week. Gains in the metals were somewhat muted in comparison to the gains in the miners. GDX and GDXJ surged nearly 16% and 11% respectively. Last week we said nothing has changed. This week figures to be the week something did change and definitely so for the miners. The strong gains in the miners since their January 19 low (31% in GDX and 23% in GDXJ) typify what could be the start of a new bull market. The current rebound can be compared to the rebounds from the major bottoms in late 2000 and late 2008. 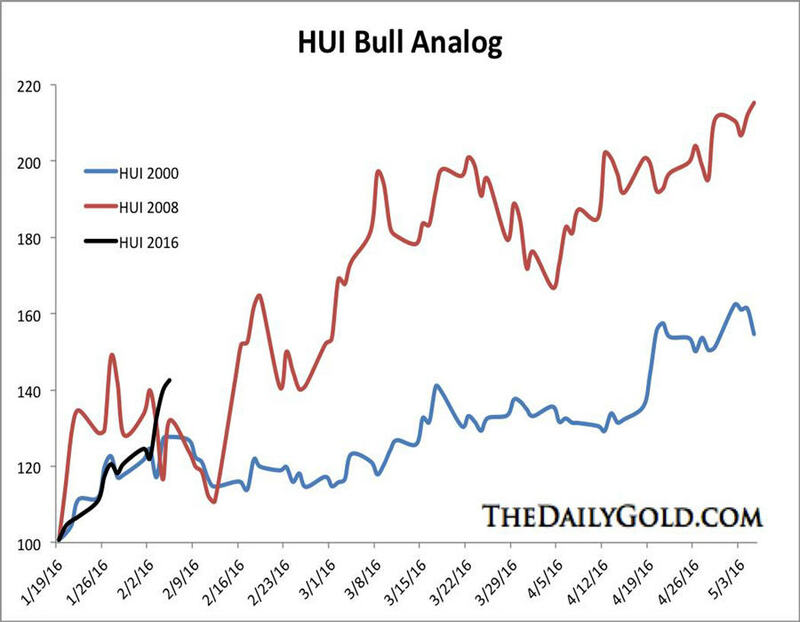 We use the HUI gold bugs index for comparison as the ETFs do not go back far enough. The HUI has gained roughly 40% since the January 19 low. That fits well with the analog chart below which puts the three rebounds on the same scale. 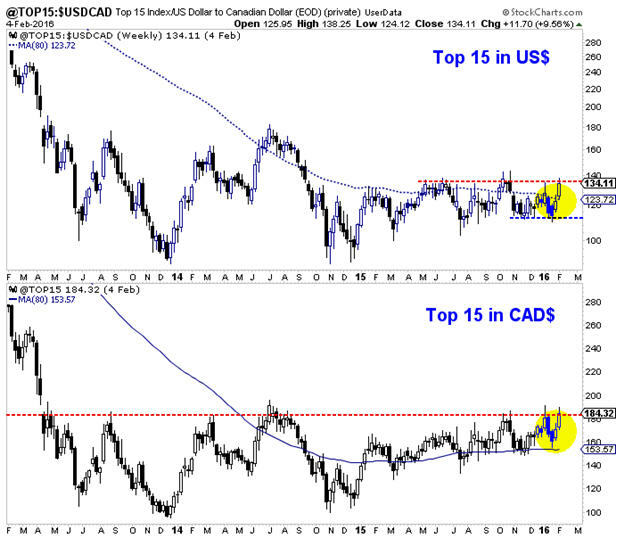 If the gold stocks are in a new bull market then they should continue to make new highs over the next few months. Next, rather than chart one of the mainstream indices, we will take a look at our Top 15 index which includes most of our favorite companies. Tuesday the index pulled back from a confluence of major resistance to close at 123. Instead of starting the next leg lower the index exploded through that resistance. Friday’s activity is not updated but as you can see, the Top 15 index is on the cusp of a major breakout. Turning to Gold, I see less evidence that Gold has established a major bottom. 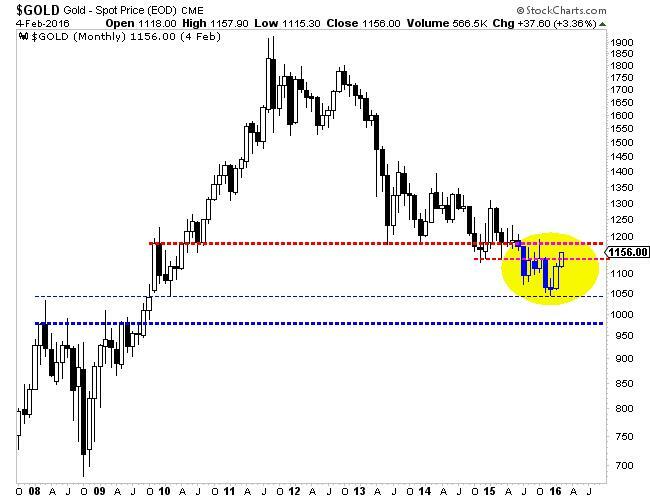 To be blunt, Gold needs a monthly close above $1180/oz, which has been a major pivot point since late 2009. First things first, Gold needs to close this month above $1150-$1160/oz. The bear scenario would have Gold making a bearish reversal sometime this month and closing below initial resistance at $1140/oz. The bull scenario would likely have Gold closing above $1160 and testing $1180 fairly soon. We should also note that while the US Dollar index failed to breakout, it remains well above major long-term support at 92 and 94 with sentiment indicators at constructive levels for bulls. As the US Dollar continues to consolidate, we want to see Gold hold recent gains and push towards $1180-$1200/oz. It would be a bad sign if Gold fizzles below $1160/oz with the US Dollar in correction mode. This past week was likely a major turning point for the gold miners and perhaps Gold itself. The strength of recent gains (in the miners) coming off a false breakdown to new bear market lows suggests that the bear market ended on January 19. We should also note that four of the five largest miners (in GDX) are trading above their 400-day moving averages and at multi month highs. Meanwhile, as shown by our Top 15 index, the strongest companies in the sector are on the cusp of a major breakout. While we have some concerns on the metals we should note that the miners lead at major turning points. The miners are telling us something has changed. Consider learning more about our premium service including our favorite junior miners which we expect to outperform in 2016.